When considering material for a banner sign, vinyl is the logical choice. The material can be combined with polyester to make a composite fabric that offers durability and waterproof features. The vinyl fabric is inherently fire retardant. Best of all, it’s light and flexible so you don’t have to lug around a heavy, bulky sign at your next trade show or conference. So why does the material you use for your banner sign actually matter? Well, it’s because fabrics have a wide range of features, some that work and some that don’t work for signs. For example, you don’t want to use a canvas sign if you’re going to be hanging your sign, putting it outside to face the elements, or if you’re hoping the sign will display a great logo. Why? Because canvas, and other natural materials, can be easily damaged and fall apart. Canvas signs will need to be replaced more often than vinyl signs, thus adding to your costs. Using paper or poster board might work for your next presentation or meeting, but for banner signs, the material doesn’t compare to vinyl. Paper and poster board can be easily torn. If you happen to fold the paper, the sign will have an unsightly crease. Poster board lasts for only so long and the color will eventually fade and lose its luster. Vinyl is an excellent sign fabric because of its ability to be printed on and its flexibility. Vinyl is also long lasting and durable. Paper and poster board signs can’t stand up to the test of time or the rigors of travel, much less the outdoors. Paper and poster boards essentially can’t get wet or withstand a lot of wind; vinyl can. Herculite Inc. offers a variety of vinyl sign products with its Bantex Banner Media Graphic Fabrics. 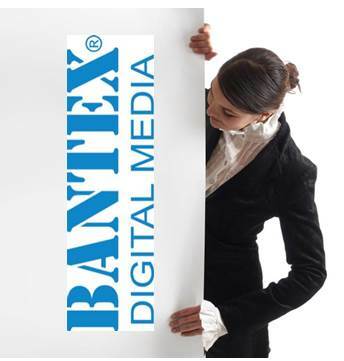 Bantex Digital Media is the premier digital print media for all solvent based, UV curable and latex digital inkjet printers. Optimal stock widths allow “full-bleed” printing on 36" and 72" output. Bantex fabrics are manufactured from the highest grades of polymer films to ensure ease of profiling and the highest resolution possible. Using its Core Stabilized Process, Herculite’s Bantex Banner Media fabrics have little to no shrinkage issues, excellent photographic print quality, micro-textured smooth surfaces, high performance reinforcement, and offer indoor and outdoor applications. So does it really matter what type of fabric or material you use for your banner sign? Yes. As noted above, different materials have different qualities. Using the wrong material for your sign can cost you in the long run. Showing up to a conference, meeting, or tradeshow with a great looking banner sign helps make you look professional.